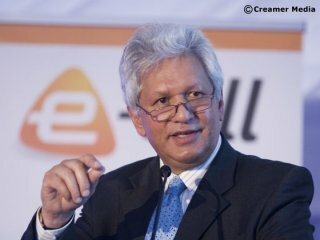 Meet Nazir Alli, the CEO of our national roads agency, SANRAL. He is the person responsible for the highway robbery that is being imposed on Gauteng highways: additional toll gates on existing roads. He also lied to the public at a press conference by saying that the highways would save motorists 20% on their travelling time, and a 10% reduction in travelling distance. What a load of rubbish. The highways have been around for decades, so how does the imposition of tolls reduce the travelling distance by 10%? Is he an incompetent moron or just a liar? And before the construction began the speed limit was 120km/h: now it's been reduced to 100km/h. It defies the laws of physics to explain how this reduces travelling time by 20%. There is even a petition web site against the tolls roads. There are more lies on the SANRAL web site, which is hosted in the USA. It denies that the toll system is double taxation. This is technically true because it is actually multiple taxation: we pay a tax on fuel (roughly R2,47 per litre of petrol) which is supposed to cover road construction and maintenance. Then we pay a vehicle registration fee every year to be permitted to drive on the roads, and of course there is plain old income tax and VAT. Nazir Alli, CEO of SANRAL presented a paper on the ethical issues in Engineering Practice in which he asked if CESA has the courage of its conviction as well as the relevance of the organisation around ethics and fraud. Alli states that SANRAL has a duty to the public and that SANRAL’s view is that good governance is the solution with all the liabilities and accountabilities that go with it and that this is the framework in which business must be conducted. He also requested CESA to look at performance indicators in the fight against corruption. He also stated that Oil, Arms and Construction are the most corrupt industries in the world and encouraged members to make use of the SANRAL tip offs hotline. His "solution" is to redistribute the congestion (at a profit of course). Public transport is either too unreliable or too unsafe to use instead of a car. I can't see myself taking my laptop through to Midrand and back every Friday. Instead I'll have to pay an extra R75 for the privilege. Another thought: The Luddite part of my character wants to just screw up the whole system by driving at 60-80km/h in the middle lane of the 100km/h road just to screw up everyone else's journey, including all those blue light convoys. I can't wait for the Madam and Eve cartoons about this.